The UK housing market has always generated a vast amount of interest and discussion, as it is one of the most important factors for maintaining a healthy British economy. Housing usually represents a household’s biggest single purchase and the largest single item of consumer wealth (2009, economicsonline.co.uk). Moreover, changes in house prices can have considerable effects on the rest of the economy. Over the last decade the house prices in the UK rose dramatically, fuelled by demand-side factors such as easy availability of mortgage finance, expectations of future house appreciations, high level of consumer confidence, speculative demand from buy-to-let investors and by supply-side factors such as low price elasticity of supply of new house-building, high price of building land and rising wages and other construction costs (Chamberlin, 2009, p. 29-30). This price inflation generated large increases in equity for homeowners but also made homeownership unaffordable for a large segment of the population (Chamberlin, 2009, p. 29). 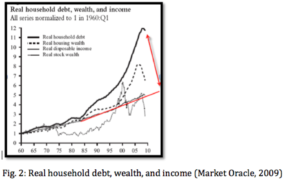 Moreover, the rising house prices and the explosion of cheap debt “led to unprecedented increase in the level of household debt” (Chamberlin, 2009, p.29) (Fig 1, 2). 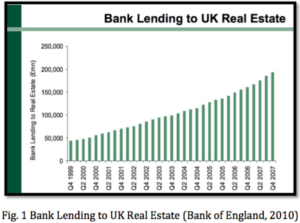 This left the UK property market in a very vulnerable position as the collapse of the US sub-prime mortgage market hit the UK financial market in 2007. As the resulting credit crunch deepened and the UK economy stalled, the housing bubble burst in 2008 provoking a sharp decline in demand for housing and led to a fall of 20% of the price of an average UK home (Pollock, 2009)(Fig 3). The full impact of the credit crunch on property markets is to be seen in detail in the following sections through the inter-related effects that it has had on both demand and supply. The demand for housing is determined by a number of factors, including house prices. It follows the Law of Demand, which states that, all other factors being equal, as the price of a good or service increases, consumer demand for the good or service will decrease and vice versa and there is movement along the demand curve (Worthington et al., 2005)(Fig.4). This inverse relationship between house prices and demand can be explained with the Income and Substitution effect: At higher prices, real income will fall and individuals will reduce their demand. In addition, at higher prices, substitutes to owning a property, such as renting appear more attractive (Economicsonline.co.uk, 2010). Reversely, when house prices fall individuals are encouraged to buy because of a rise in their real income and because renting seems less attractive. However, it must be noted that the UK housing market is also “partly speculative, so that a rise in prices can lead to a rise in demand as buyers anticipate a speculative gain” (Ecomomicsonline.co.uk, 2010). Moreover, a fall in prices does not guarantee a rise of housing demand when other factors are at work. 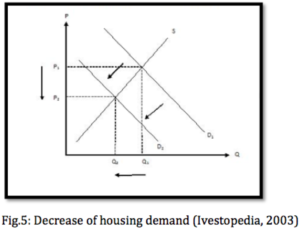 As it is to be seen in the following subsections the credit crunch impacted heavily a number of other factors determining demand, which caused a shift of the demand curve to the left, thus further decreasing the demand for housing (Fig.5). The global credit crunch encouraged banks and building societies to cut back on lending in order to “rebuild balance sheets and hoard liquidity in the face of large and uncertain losses in financial assets based on residential and commercial property loans” (Chamberlin, 2009). The sharp reduction in mortgage availability made it harder for consumers to find affordable finance, reduced demand for housing and led to a fall in house prices (Mintel, 2009). Considering the fact that in 2007 63% of the total housing transactions were mortgaged purchases (Nationwide, 2010), the implications of the credit crunch were damaging not only for the property market but also the wider economy. Among the many who were forced reduce their coverage or exit the buy-to-let mortgage market were the three major players: Northern Rock, nationalized in February 2008; HBOS, merged with Lloyds TSB in January 2009; and Bradford & Bingley was split into two parts in September 2008 (Mintel, 2009). This caused a sharp fall in the number of mortgages approved for house purchases to 17,773 in 2008 against 64,014 in July 2007, a fall of 72% (British Bankers Association, 2008)(Fig. 6). Moreover, the number of buy-to-let loan products has fallen by 95% between 2007 and 2009 (Mintel, 2009). According to economists from Capital Economics mortgage approvals are currently at 40% lower than their long-term, pre-credit crunch average and 30% lower than the level which history suggests is required for sustained house price rises (Shah, 2010). Lastly, despite the phenomenally low Bank of England base interest rates of 0.5% the mortgage interest rates remained relatively high 5,4 % in April 2010 (Office for National Statistics, 2010) due to the general uncertainty in the financial markets thus keeping the housing demand down. Privately owned housing is a normal good for most people, as disposable income rises, the total demand for housing expands, as does the demand for more expensive properties as people try to climb up the property ladder (Worthington et al., 2005). 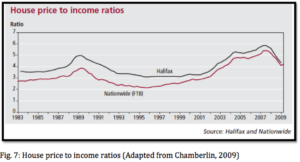 However, as the credit crunch unleashed a wide economic recession, household wealth fell by 15% between 2007 and 2008 (Halifax, 2010) and income was further expected to decline, housing demand, being income elastic, declined. A negative wealth effect is created when houses fall creating a fall in equity (Economicsonline, 2010). Due to the credit crunch, owners saw their major asset- housing decline in value to the extent of creating negative equity. Negative equity exists whenever the mortgage on the property is greater than the market value of the property (Housing Market,2008). This has two major negative consequences. First, homeowners might not be able to refinance their mortgage and are forced to sell. Second, they might not be able to remortgage for the purpose of equity withdrawal (Market Oracle, 2009). Therefore there will be a significant fall in spending caused by reduced equity withdrawal. Loans for equity withdrawals, which have been vital for the UK’s consumer boom as homeowners borrowed against equity to spend has fallen by 49% by 2009 (Market Oracle, 2009). The cool-down in the housing market has not necessarily approved affordability. Although falling prices could make home ownership more affordable the price of the average UK home is still 4 times higher than the average earning (Chamberlin, 2009)(Fig. 7). 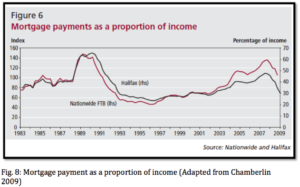 Furthermore, house prices are so expensive that they force people to take big mortgages, whose monthly payments consume nearly 50% of people’s disposable income (Chamberlin, 2009) (Fig. 8). 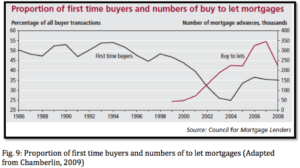 The credit crunch is particularly hurting the first time buyers, with “lenders applying tighter criteria, demanding larger deposits or taking mortgage products off the market” (Glossop, 2008) (Fig. 9). First time buyers are important because they are a source of liquidity for the whole housing market and without them the rate at which transactions proceed may stall, putting downward pressure on house prices (Chamberlin, 2009). Lastly, existing homeowners faced considerably higher payments as mortgages came up for renegotiation and the number of repossessions rose to 50% between 2007 and 2008 (Glossop, 2008). The supply for housing follows the law of demand, which states that all other factors being equal, as the price of a good increases, suppliers will attempt to maximize profits by increasing the quantity of the housing sold (Investopedia, 2010) (Fig. 10). As mentioned in the Law of Supply, price is usually a major determinant in the quantity of housing supplied. When housing demand is strong we usually see an expansion in construction and rising prices. However, the housing supply in the UK is notoriously inelastic (Housing Market, 2008). This means that when house prices rise, there is no corresponding increase in supply, because there are various factors that impede the market to build new houses (Housing Market, 2008). Therefore the UK housing market suffers from a chronic shortage of housing (Ruddick, 2010) and any change in demand results in volatile swings in prices. There are always relatively long time lags between a change in price and increase in the supply of new housing (Tutor2u, 2010) (Fig. 11). 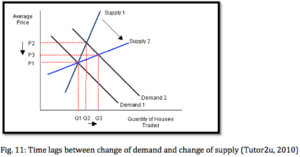 When demand shifts outward and supply is inelastic the result is a large rise in market price and a relatively small expansion of the quantity of houses traded. New house development is one of the main sources of supply for the housing market. The key factors affecting housing supply are lack of land, governments’ planning restriction on land use and, more importantly, developers’ profitability of building new houses. (Housing Market, 2009) The profitability depends of the demand for houses and prices. Therefore, the economic recession sparked by the credit crunch resulted in declining affordability of houses, which strongly affected the demand and prices in the market. The sharp fall of demand and prices reduced turnover in new build sales, which has already resulted in lower building activity. It is reported that housing supply grew at a rate of only 172,000 units in 2007, falling far short than the Government’s 240,000 new homes per year target (Glossop, 2008). In addition, similarly to the demand side, the credit crunch made it more difficult for developers to obtain cheap credit for their projects. Commercial loans typically used to fund new developments have become scarcer and more expensive as a result of the credit crunch (Chamberlin, 2009). Lastly, expectation is also a supply-shifting factor. Developers expected the prices of housing to increase soon after the bust, so they decreased the quantity supplied at a given price in order to be able to supply more when the prices increase (Fig. 12)(Netmba, 2010). The future of the UK housing market is filled with mixed points of views. We examine a number of real estate agents and research studies to gain a better understanding of this topic. Cook (2010), director of the estate agents Savills, has been careful with setting out concrete predictions and has based his forecasts on how the economy will develop. 2010 will end with prices down by three per cent in the UK with a two per cent fall in Scotland and a six per cent fall in Wales. For central London his predictions are that if there are no more financial shocks and stock levels continue to match demand, then 2010 could end with a 0.6% fall in prices and 2011 could already end with an 8% increase. However, the economy could affect negatively these predictions if it does not stabilize and unemployment continues to increase. In this case Faulkner (2009) believes prices could fall 3.4% in 2010 and only then grow by 9% in 2011. Capital Economics (research consultants) are predicting property prices will fall by 10% in 2010 and a further 5% in 2011. This is mainly due to the high unemployment rate that is the outcome of the recent recession (Faulkner, 2009). Bailey (2010), a research analyst at Knight Frank Estate Agents, suggests London residential property prices will grow by 3% in 2010 and 9% in 2011. Bailey believes it will take until 2014 to match peak property prices achieved in 2007. The recent reports by Lloyds Banking Group (2010) show a 5.2% rise between Q1 2009 to Q1 2010 of house prices and suggest the rise is more likely to be linked to the shortage of houses being put on sale. 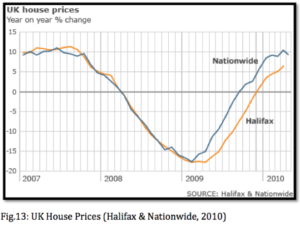 Nevertheless, both Halifax and Nationwide have released figures showing houses prices back up almost at their 2007 level (Fig. 13). It is a huge surprise that house prices have managed to go up again so soon, as most of the forecasts did not predict the prices to rise in 2010. However, if we look closer at the situation we can see that the government has contributed a lot to this rise through financial stimulus to the economy, low interest rates, car scrappage scheme and the bank bailouts. With the newly elected government the situation might not be as nice as a series of budget cutting measures are being planned along with tax increases, which could all impact negatively the house prices. Therefore the possibility house prices may fall by a few percent towards the end of the year and the beginning of next year is still open. The credit crunch has led to retrenchment of consumer and business spending which was followed by job losses and deterioration in the housing market. The sharp dislocation of the credit markets accelerated sharp adjustments in both price and volume of the property traded, with a large sudden shift in investor sentiment against the sector. As analyzed above, both housing demand and supply were significantly reduced, sending shockwaves across the whole British economy. It is yet to be seen whether the confidence in the UK housing market will be soon restored. Bailey, L. (2010). Frank Knight. [Online] Available from <http://resources.knightfrank.com/GetResearchResource.ashx?id=11791> [7 June 2010]. BBC. (2010) House prices still rising, says Nationwide. [Online] Available from <http://news.bbc.co.uk/1/hi/business/10219681.stm > [7 June 2010]. Capital Economics. (2009). Economic Analysis for UK housebuilders, developers, mortgage lenders, surveyors and investors. The Housing Market Analyst. 4(2). [Online] Available from <www.capitaleconomics.com> [7 June 2010]. Chamberlin, G. (2009). Recent developments in the UK housing market. Office for National Statistics. Economic&Labour Market Review, 3(8). Cook, L. (1020). House asking price rise before general election is ‘surprising’. [Online] Available from http://www.aboutproperty.co.uk/news/house-asking-price-rise-before-general-election–surprising–$1372776.htm [7 June 2010]. Ellis, R. (2008). Credit crunch and the property market. Greater London Authority, City Hall. GLA Economics. [Online] Available from <http://www.london.gov.uk/mayor/economic_unit/docs/credit-crunch.pdf> [13 June 2010]. Faulkner, K. (2009). House price predictions for 2010. 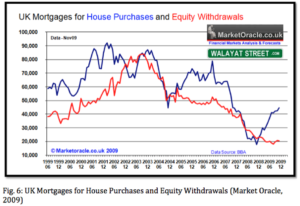 [Online] Available from <http://www.channel4.com/4homes/property-money/house-prices/channel-4-news-4homes-house-price-predictions-for-2010-09-10-27_p_1.html> [7 June 2010]. Glossop, C. (2008). The Credit Crunch and Implications for the UK Housing Market. Centre for Cities. Housing Market. (2009). Factors Affecting Demand and Supply for Housing. [Online] Available from <http://www.housingmarket.org.uk/house-prices/factors-affecting-demand-and-supply-for-housing/08/ > [7 June 2010]. Housing Market. (2009). Economic Impact of a Housing Crash. [Online] Available from <http://www.housingmarket.org.uk/house-prices/factors-affecting-demand-and-supply-for-housing/08/ > [7 June 2010]. Inflation. (2010) Office of National Statistics. [Online] Available from <http://www.statistics.gov.uk/cci/nugget.asp?id=19> [7 June 2010]. Investopedia. (2003). 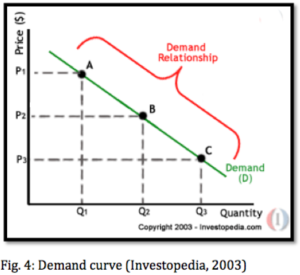 Economics Basics: Demand and Supply. [Online] Available from <http://www.investopedia.com/university/economics/economics3.asp > [7 June 2010]. Jones, C. & Watkins, G. (2009). Housing Markets and Planning Policy. John Wiley and Sons. Lloyds Banking Group. (2010). House Price Index. [Online] Available from <http://www.lloydsbankinggroup.com/media/pdfs/research/Q1_2010/UKOverviewQ12010.pdf > [7 June 2010]. Nationwide. (2010). House prices now less than 10% below their 2007 peak. [Online] Available from <www. nationwide.co.uk/hpi> [7 June 2010]. NetMBA. 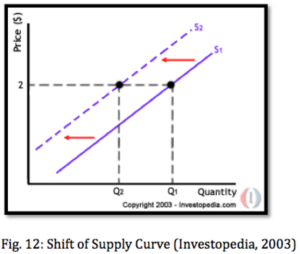 (2010) The Supply Curve. 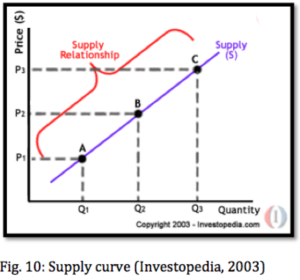 [Online] Available from <http://www.netmba.com/econ/micro/supply/curve/ > [7 June 2010]. Pollock, I. (2009). Will house prices go up or down in 2010? BBC News. [Online] Available from <http://news.bbc.co.uk/1/hi/business/8386796.stm> [13 June 2010]. Ruddick, G. (2010). Post-election cuts herald UK housing shortage. [Online] Available from <http://www.telegraph.co.uk/finance/newsbysector/constructionandproperty/7604334/Post-election-cuts-herald-UK-housing-shortage.html> [7 June 2010]. Tutor2u. (2010). Demand and Supply for Housing. [Online] Available from <http://tutor2u.net/economics/content/topics/housing/housing_demand_supply.html> [7 June 2010]. United Nations. (2009). World Economic Situation and Prospects 2009. United Nations Publications. Walayat, N. (2010). UK House Price Trends for 2010 According to the Halifax and Nationwide. [Online] Available from <http://www.marketoracle.co.uk/Article20121.html > [7 June 2010]. Web, M. (2009). When will house prices bottom out- and how will you know? Money Week. [Online] Available from <http://www.moneyweek.com/investments/property/merryn-somerset-webb-uk-house-prices-fall-02203.aspx> [7 June 2010]. At the start we made our team based on the expectations we had from a good team. Then we had a meeting to discuss about the project and also possible subjects. We shortlisted the topics and sent it to Dr Hakimian. Kindly he approved The Effect of Recession on the UK Housing Market. The group had another meeting to arrange tasks and allocate people to accomplish them. We made different part of research and everybody was responsible to collect and analyse different types of data. Then we made group into two teams. One team worked on the final edition and made the report in order and professefional format. Another team started to work on presentation. 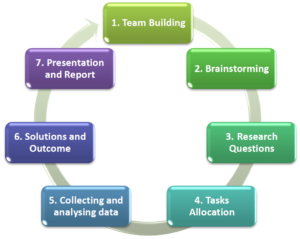 That job included making videos, photos and extracting bullect point based on the research. Finally presentation was prepared on time and we had an acceptable presentation.